Backyard Bee Hive Blog: Primer: When to Feed Pollen Substitute? Primer: When to Feed Pollen Substitute? Disclaimer: this post is a collection of a Notes to Self because feeding is a complicated issue and I can't remember anything unless it's written down. In addition to carbohydrates from honey or sugar syrup, bees also need protein and minerals. Young bees need protein to strengthen their muscles, and also to produce brood food. Naturally, they get their protein from pollen. When it is in short supply, both the house bees and the brood they are raising may not develop to their full potential. In times of dearth, pollen substitute or supplement can help. Pollen Substitute is a pollenless combination of soy flour, brewer's yeast and milk powder. Pollen Supplement is just substitute plus real pollen. Either substitute or supplement can be combined with honey or syrup to make it shapeable into a patty. 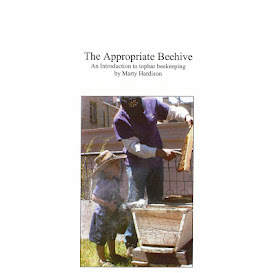 The advantage of a patty over the dry powder is quickness of putting into the hive. Patties should be placed directly over the winter cluster. We don't have small hive beetles in Colorado, so the patties won't become breeding grounds for them. While easy and inexpensive to make on your own, I don't like having miscellaneous leftover ingredients hanging around for which I need to find both containers and storage space. Small house, remember? There are several premade options available, but so far I've only purchased MegaBee Hybrid Patties. My bees liked it, and I attribute their survival two winters ago to it. Here's how we did it. WHEN TO USE - Feed when a colony needs help. The Fall feeding is the most important feeding; it affects the health of the bees that will eventually raise your Spring bees. Feeding pollen in the fall helps insure that the young bees will have fully-developed glands necessary for them to make the brood food needed in the late winter and early spring. Essentially, you are feeding the bees that will be feeding future bees. You must generate at least two rounds of new bees, so that's 6 weeks of feeding minimum. Nine weeks of continuous feeding is better (from mid-August to mid-October*) because you'll have nurse bees going into Winter. These nurse bees will raise your early spring bees, the ones you'll see flying in Feb. that will make you think, "Yay, they survived!" Note that while a larger cluster is less likely to suffer isolation starvation, one that is tending brood is more likely to. For final winterization procedures in late-October, consider making a candy board with a full pollen patty embedded. "Winter Patties" are a good choice since their low-protein/high-carb formulation won't promote brood production but will give the bees additional carbs to maintain heat over any brood present. If you have a small Winter cluster (smaller than a grapefruit), emergency feeding can bring up the population so it is better able to manage hive temperatures. Starting 2/1 works out to one full 40-day lifespan of a worker bee before the first pollen flow (Silver Maples). This timing includes the bee's time as a nurse when it cares for the next flush of bees, and three weeks of early season pollen foraging. Generally, early season pollen is enough to sustain a small colony coming out of Winter. However, since the presence of brood in the colony stimulates pollen foraging, you can try for a bigger population earlier by feeding earlier, say January 21. If they take the sub, you will have mature bees ready and waiting to really take advantage of the first pollen flow. Start with either a Winter formulation or a partial patty so you don't have too big a population at first, in case the flow starts late or you have a cold snap. The cluster must be able to cover all brood you're pushing them to raise. You are raising the bees that raise the bees that collect pollen to raise more bees, so feed continuously, increasing the amount as the population builds. In February/March a healthy colony may be expected to consume a one pound patty in one week. Stop when natural pollen is abundant. Watch the crabapples (April), and Mayday (cherry) trees, which are very good pollen sources. Remember, March (our snowiest month) is typically when colonies starve out, but if the weather is unseasonably warm, February is more likely. Raise the bees that raise the bees that raise even more bees that collect nectar. A honeybee colony isn't able to predict a nectar flow and build in anticipation. Rather, a honeybee colony builds in response to a nectar flow. Let's say the Linden flow lasts 3 weeks. That's just long enough to raise one round of brood. At 3 weeks of age, those bees are mature enough to forage but the flow is over. No honey. However, if you start feeding before the major nectar flow, you can have the population needed to make it a honey flow. For a maximum crop (enough for both the bees and a harvest) start feeding 9 weeks prior to the nectar flow. Typically the Lindens start flowing the last week of June; warm winters can set them off as early as mid-May, or excessive drought can delay blooming into July; adjust the start date accordingly. *Don't Fall feed past mid-October or you'll run the risk of having Winter brood that will cause your bees to consume stores, leading to starvation.